The flight landed at TIA airport, also known as Kathmandu International Airport, at 14:20 local time (08:35 GMT), according to flight tracking website FlightRadar24. The Nepal Army has been pressed into rescue operations and the Tribhuvan International Airport has been closed. Kathmandu: A US-Bangla Airlines passenger plane carrying 71 people crashed on Monday while coming in to land at the airport in the Nepali capital, Kathmandu, an airport official said. Victims' bodies have been recovered from the wreckage, an official said. "We just pulled out dead bodies and injured from the debris," government spokesman Narayan Prasad Duwadi told AFP. Plumes of black smoke could be seen rising from the football pitch where the plane crashed, to the east of the runway at Nepal's only international airport, in the capital Kathmandu. "There were 67 passengers and 4 crew members" aboard the plane, said airport spokesman Prem Nath Thakur. "So far 20 injured have been taken to the hospital. Police and army are trying to cut apart the plane to rescue others," he added. The Nepal Army has been pressed into rescue operations and the airport has been closed. The official, who spoke on condition of anonymity because of airport policy, said the flight was arriving from Dhaka, the Bangladesh capital. He said the plane appeared to have caught fire just before it landed and skidded to a stop in a field beside the runway. Its poor air safety record has been blamed largely on inadequate maintenance, inexperienced pilots, and substandard management. In early 2016, a Twin Otter turboprop aircraft slammed into a mountainside in Nepal killing all 23 people on board. Two days later, two pilots were killed when a small passenger plane crash-landed in the country's hilly midwest. US-Bangla Airlines is a unit of the US-Bangla Group, a U.S. Bangladeshi joint venture company. The Bangladeshi carrier launched operations in July 2014 and operates Bombardier Inc and Boeing aircraft. Secondo la BBC ci sarebbero 22 sopravvissuti. 40 al momento il numero confermato delle vittime. mah, ho ascoltato ATC e francamente tutte queste critiche verso l'inglese utilizzato non le condivido (vedi commenti), quanto piuttosto trovo incredibile la confusione che scorre a fiumi tra two-zero e zero-two a KTM (rispettivamente south e nord landing). Atterri di qua che atterri di la' = crash. Assurdo, anche perche' quando ATC gli dice di virare a destra con "runway on sight" e' perche' ATC sa dove stanno, mentre il crew sembra assai confuso (a parte la voce da ubriaco di chi parla alla radio). Infine, al 3:10" ATC dice chiaramente "Again! DO NOT...."....quando gia' prima gli aveva detto "DO NOT LAND, ON HOLD". Poveracci, schiantati e forse bruciati per miscommunication, nel 2018. Ground observers reported the aircraft turned suddenly left, overflew two aircraft, came very close to the control tower and went out of sight. A large plume of smoke began to rise seconds later. The airport reported the aircraft veered right off the runway and slid for about 300 meters until coming to a rest on a soccer field and burst into flames. The airport later added: "The plane flew past just above the air-traffic control tower during its descent for landing. It touched down the ground just next to a parked plane and ploughed through a fence on the east side of the airport, and plunged into the lower ground." il povero controllore a un certo punto si rende cono che questi non sanno più dove sono e cosa fanno, e li autorizza ad atterrare per 02 o se vogliono per 20. Prima gli dichiarano VFR, poi che non vedono la pista, poi che la vedono... ma che si erano fumati in cockpit sti due? Nepalese investigators have detailed the extraordinary approach path taken by a US-Bangla Airlines Bombardier Q400 before its fatal impact with the runway at Kathmandu. Such was the erratic course taken by the aircraft in its final moments of flight that controllers at Kathmandu tower physically ducked at one point, because the Q400 was heading towards the tower in a vain, last-ditch bid to land on runway 20. 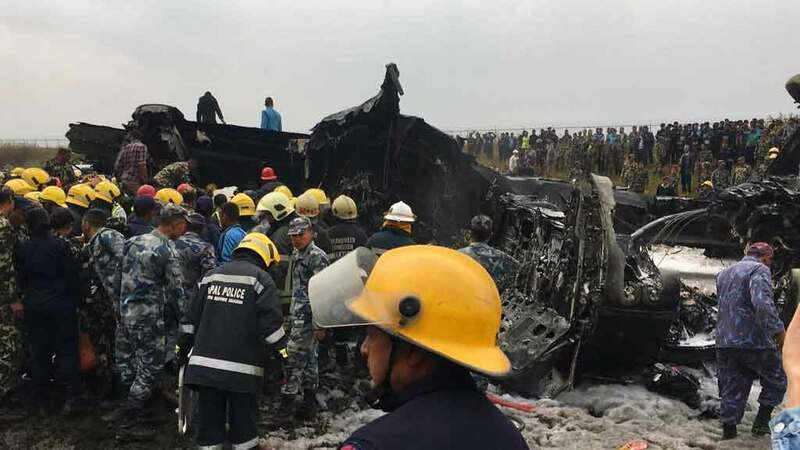 The Nepalese accident investigation commission found that evidence of difficulties emerged after the aircraft was cleared for a VOR approach to runway 02. Owing to their being engaged in “unnecessary conversation”, says the inquiry, the pilots forgot to cancel a hold instruction in the flight-management system, only realising their error when the Q400 started turning left to enter a holding pattern. In an effort to regain the approach path, the captain selected a heading of 027° to turn back towards the 202° inbound. But the aircraft, experiencing winds from the west, overshot the radial and continued to deviate to the east of the approach path. The aircraft reached a point 2-3nm north-east of the VOR and the Kathmandu tower controller informed the pilots that, while landing clearance had been granted for runway 02, they appeared to be heading for the opposite-direction runway 20. After the captain confirmed the aircraft would land on 02, the aircraft began a right-hand orbit, exiting towards the west after a three-quarter turn, before crossing perpendicular to the extended centreline of runway 20. The tower controller instructed the Q400 to remain clear of runway 20 and to hold position, because another flight, a Buddha Air aircraft, was landing on runway 02. After giving the Q400 the option to land on either runway, the aircraft entered another right-hand orbit, north-west of the airport. As it orbited through a south-east heading, crossing the extended centreline again, its captain stated that he could see the runway, and requested landing clearance. The inquiry says the aircraft turned right in a late bid to regain the centreline but crossed the threshold of 20 while virtually heading west. “Alarmed by the situation, the tower controller hurriedly cancelled the landing clearance of the aircraft,” it adds. The aircraft then banked sharply left over the domestic apron, flying so low that the controllers, for an instant, believed it was heading for them. “While the aircraft was turning inwards and momentarily headed towards the control tower, the tower controllers ducked down their heads out of fear that the aircraft may hit the tower building,” says the inquiry. The Q400 missed the tower, and descended on a south-east heading towards the centre of runway 20, banking to the right and touching down on the right-hand main landing-gear, while 25° off the centreline heading, before suffering an excursion that destroyed the aircraft. Investigators state that the landing was probably made in “sheer desperation”, with “no attempt” at executing a go-around – even though this was still possible up to the point when the aircraft struck the runway. The inquiry details the increasing pressure on the crew, stating that they experienced a “complete loss” of situational awareness and were facing the threat of surrounding high terrain which triggered “multiple” alerts from the ground-proximity warning system. Cockpit-voice recordings show the pilots’ conversation indicated they had entirely lost their orientation with respect to the runway, but that they did not communicate this to controllers. As the crew manoeuvred the aircraft, during the orbits north of the airport, they subjected it to bank angles of 35-40° and descended to within 175ft of terrain. Casino è ancora poco... Ma a parte i due nel cockpit, come è possibile garantire la discesa per 02 o per 20? Più che un aiuto mi sembra una complicazione o quantomeno un incentivo a creare qualche situazione anomala. no ma da 0.26 il passaggio sulla torre e’ da matti, ma che stavano facendo ??? ?